Hey, Calgary Flames fans…relax! So your team missed the Stanley Cup Playoffs for the first time since 2003. Big deal. What exactly were you expecting? In a way, the Flames have the same problem as the Oilers – they reached a Stanley Cup Final that they had no business reaching. The Oilers did that in 2006. Calgary did it in 2004. You remember 2004. Right before the “Lockout from Hell.” When scoring in the NHL was non-existent. Your Flames finished sixth in the Western Conference, with 94 points. Then the problems started. The Flames upset third-seeded Vancouver (101 pts) in the first round. Then shocked Detroit (109 pts) in the second. In the third round, San Jose (104 pts) never had a chance. The Tampa Bay Lightning finally stopped the silliness in Game Seven of the Stanley Cup Final. Here’s the rub. Because of that run, you think that Flames’ squad was a great hockey team. They were not. They were a very average team, playing way above its head. Superman Jarome Iginla did everything he was supposed to do. But, to get to the Stanley Cup Final, the Flames relied heavily on a goaltender playing ridiculous hockey. Hockey he could never hope to repeat. And Miikka Kiprusoff has not. Because of 2004, Flames’ fans think Kipper should be able to do that again. Not possible. Plus, surrounding Iginla, you had a couple of players having once-in-a-lifetime springs – Craig Conroy and Martin Gelinas. And that ain’t never gonna happen again either. 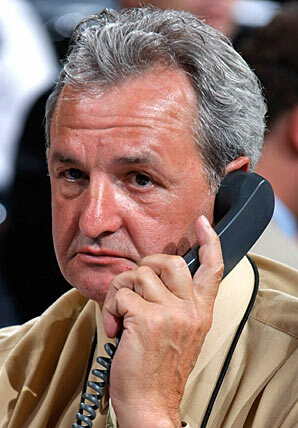 In his seven years as Calgary’s general manager, Darryl Sutter has been unable to surround Iggy with enough talent. Talent to get opposing shut-down lines off Iginla’s line. Talent to give him someone to rely on. Talent to score goals, for Pete’s sake! Instead of being bummed out, Flames’ fans should be happy for five successive seasons of playoff hockey. And, if you’re not, how about the seven straight dark springs you suffered through from 1997-2003. Remember, you could be Edmonton Oilers’ fans! Although they will get a very high draft pick. Clearly, being “average” in today’s NHL does not pay.